I’ve just been on vacation for a full week and it has been amazing! I got to go home for a few days and see my family. I have seven nieces and nephews and every time I go home to see them – around two to three times a year – they’ve changed and grown and I get to know them all over again. It’s really wonderful. I also got to eat some delicious food with my favorite aunt and uncle: Julia Child’s Chicken Melon aka what I call, “Chicken taken out of it’s skin, smushed up with other stuff, and stuck back inside it’s own skin,” venison egg rolls, pumpkin soup, Meyer lemon sorbet, and peach and cornmeal upside down skillet cake. Amazing. I ran on the Prairie Path and finished Special Topics in Calamity Physics (thanks for the recommendation, Maura!) and The Dream Thieves. I ate cheese. I watched Doctor Who (I’m really late to jumping onto Doctor Who bandwagon – I cried when Donna “died.” Nerd alert). I tried to check my work email only sparingly. I did have to do a tiny bit of work coordinating a presentation I didn’t know I was doing next week (surprise!) but other than that it was relatively work free. 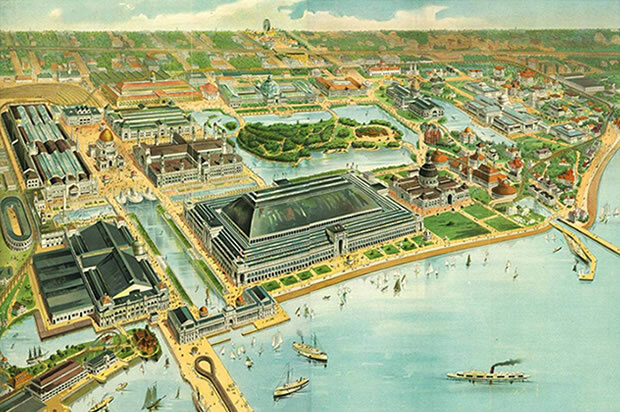 If I was really resting, I’d be hanging out at the 1893 World’s Columbian Exhibition in Chicago avoiding serial killers. (I can’t really post of picture of Chicago because I didn’t quite make it into the city and pictures of the suburbs are suburb-y). Anyway, all of this to say that vacation had me thinking about, well, vacation. It’s important. Not vacation itself, but the idea of vacation, the idea of rest. My friend Beth wrote a great post on her blog about keeping the Sabbath and rest. While I was resting with family and friends (cheese counts as a friend…) I was remembering how vital it is to have some time to rest, relax, and just be. Sometimes that resting means reading or finishing the curtains for my room or getting coffee with friends or going for a walk. It’s good to have time away from work to do that because even though we joke at the library that we’re “not saving lives” and that are work can wait a day, it is important. It’s important because books, literacy, access to technology, programming, help, kindness, and a safe place for someone to stay a few hours without having to buy anything is important. All of that importance and the amount I care about my job takes a lot of energy. That needs to be recharged every once in a while. That’s why using your weekends and other time off is crucial. So find your way to relax where you don’t have to think about work. Is it getting a drink with friends to catch up or watching the football game on Sunday. Whatever it is, find it and do it. Not just for your job, but for your own sanity. ‹ PreviousSeries recaps – what do you use? I totally agree…we all need time to rest and re-fuel mentally! Reminder to self…take a VACATION! I completely agree. Part of what I do in Boxford is social media… so my brain is forever on the lookout for stuff to share and post. I stash stuff in an evernote note I use for that purpose or schedule it on the communal calendar. I also trained myself to be organized. It doesn’t come natural to me and when I reach a critical mass of disorganization I sit down and sort everything out; be it dirty laundry (literally) or work projects. There’s simply not enough time on work days sometimes. One thing I’ve learned about supposed adult-hood is that in order to relax one has to ignore everything.